We are getting so close to our end of the year performances. It seems like just yesterday we were sizing for dance shoes and ordering music books. As we come to an end we are already planning for next year. Every year, we send out a survey after all of our performances are over. This is such a great way for you to leave us feedback. We would love to hear everything…. good, bad, etc. It is great to hear things you love, so we know to keep doing them, and it is crucial we hear about things you wish we changed. We personally read every single survey and share them with the staff. It is such a great way to make APA better every year. We appreciate you taking the time to fill this out for us. Another one of our favorite things going on is our daddy/dancer production that we perform at our June dance showcases. This is a free event and we hope to get as many dads involved! (If dad isn’t available, feel free to invite your uncle, grandpa, etc.) 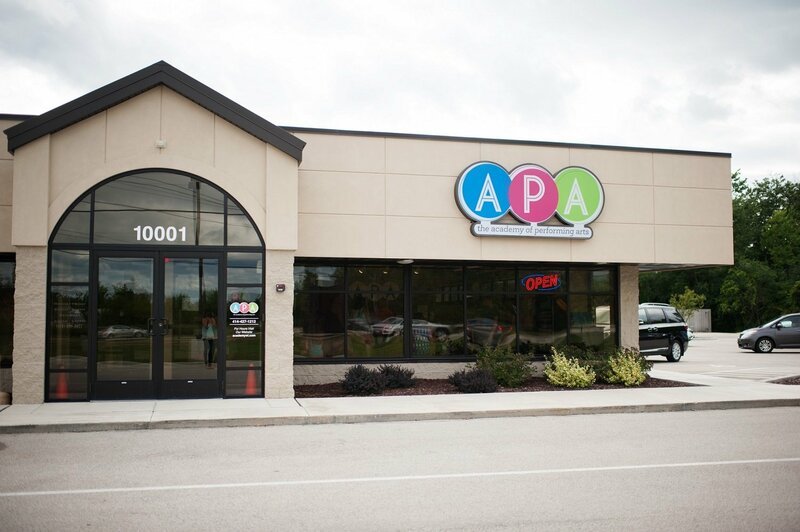 We will have free classes at APA for you to bring dad and learn the dance OR we will send out the video link in the June newsletter for you to learn on your own. 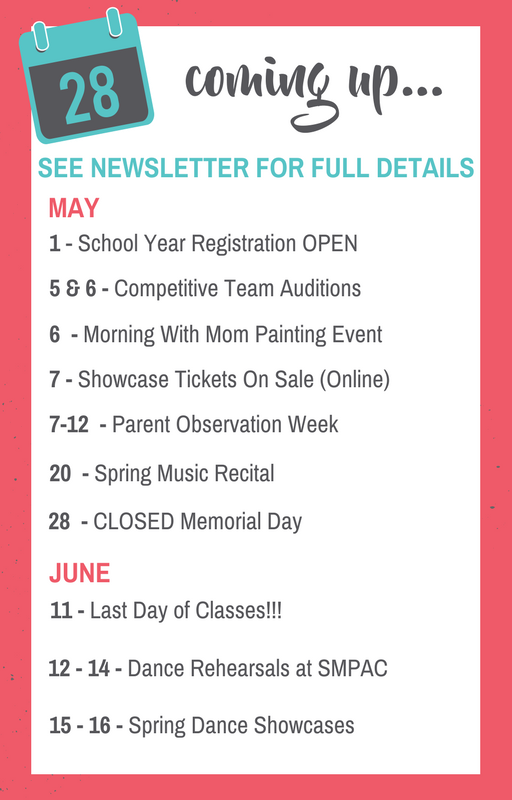 Practice dates are listed at the bottom of the newsletter under our spring dance showcase information. We know how many questions pop up this time of year, so please do not hesitate to call, email, or stop in. We are here to help and want to make sure you know what is coming up! License Plate Winner – Congrats to license plate J42-YJJ. One of our staff members spotted your Academy window sticker while driving! Please contact the front desk so we know who you are and you will receive a $50 tuition credit. To participate, grab a FREE window sticker at the desk! Logo Wear for Sale – You can click the link below and place your order online. Our store will close on the 10th of the month and will not reopen until the 1st of the next month. All orders will take 3-4 weeks after the store closing date and will be shipped for free to APA. Click here to order! Yard Sign Contest – Our yard sign contest is back! Grab a yard sign from the lobby of either location and place it in your yard. If we spot your house you could be our next tuition credit winner. If you’re our lucky winner you’ll receive a $50 tuition credit. Winners are announced via Facebook. You must comment in on the post if it is your house that is the winner. Saying Goodbyes – This year we will be losing some staff members as they pursue other opportunities. From our dance department Miss Jessica & Miss Caroline will be leaving and from our music department Miss Rachael, Miss Jackie & Mr. Sam will be leaving. We want to thank these teachers for all they have done for our students and families at APA. We’ve enjoyed having them with us. We have already hired replacement teachers to take over their spots. Competitive Dance Team Auditions – If you’re student is interested in auditioning for our 2018-2019 competitive teams, please email our performance team coordinator, Miss Trisha, at [email protected] Our auditions will take place at our Oak Creek location the weekend of May 5th-6th. Pre School “Rummage Sale” – Miss Michelle and Miss Lisa are re organizing and will be selling many items from preschool. Including toys, shelves and supplies. We will have a “rummage sale” at the Oak Creek location on Wednesday, May 30th from 10am – noon. All proceeds will go back to the preschool to get new supplies for the next school year. We hope to see you there! Memorial Day Weekend – We will have regular classes through Saturday, May 26th. We WILL be closed Sunday, May 27th and Monday, May 28th for Memorial Day. Automatic Withdrawals – Automatic withdrawals for tuition will stop after May 15th for everyone unless you sign up for our fall session. Dance Classes: You are charged full June tuition for 2 dance classes, rehearsal, and showcase. Our last class at the studio before summer break will be on Monday, June 11th. If you have any questions, please let us know! ***If you are NOT performing in the spring showcase, please let us know and we will pro-rate your tuition. Please email us or notify our front desk by May 14th. Music Classes: Please check out your music fee schedule located on the back side of the Academy calendar to see how many lessons you will be charged for on May 15th. Our last class will be on Monday, June 11th. Music Student: Adison Kulmann – Adison has been taking piano lessons at The Academy for a few years. 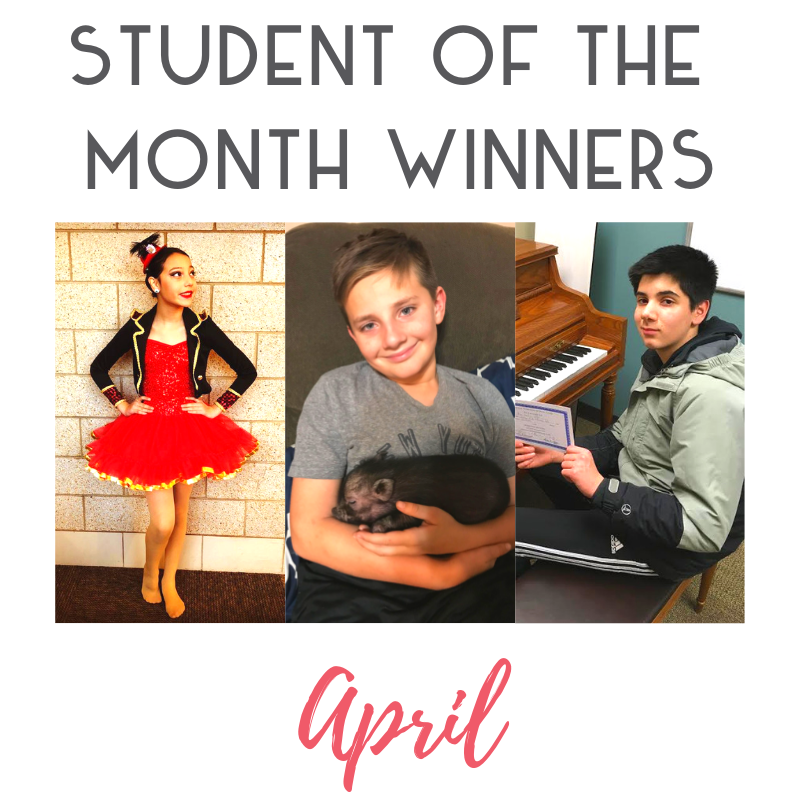 This past year she has committed to improving her piano-playing ability to meet the future goal of being able to accompany students during their church choir practice. 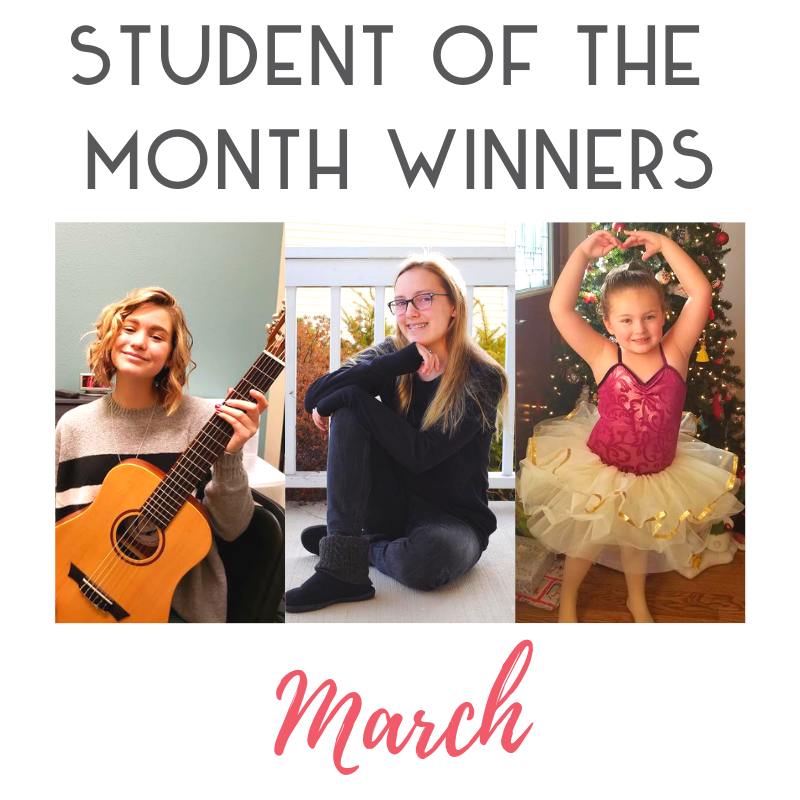 To work toward this aspiration, she has improved her weekly practice time, challenged herself by playing recital pieces that are above her current method book level, and has consistently met all weekly objectives given to improve her piano songs. Adison is a motivated and talented student, and is a complete joy to teach! Adison was nominated by Miss Tiffany. Recreational Dance Student: Elyse Johnson – Elyse always comes to class smiling and with a positive attitude. She works hard in every class and gives her all. Elyse takes corrections and applies them to improve her skills. Elyse is a kind and encouraging to her classmates. Congratulations Elyse! Elyse was nominated by Miss Amy. Competitive Dance Student: Lylah Doyle – Lylah is an exemplary student and performer. She always comes to classes excited, rehearsed and ready to learn! Lylah is also an amazing team mate. She is always willing to help others with questions, choreography or just a friendly smile during a challenging class. She comes everyday ready to work and give it her all. Thank you Lylah for bringing your joy and talent to our competitive programs! Lylah was nominated by Miss Alyse and Miss Heather. Parades – Sign up for all our parades and get full details by CLICKING HERE. Participation in the parades is always FREE, but registration is required. Meeting location and times will be emailed out a week prior. Parade details (routes, etc..) for each city can also be found on each cities website. 4th of July Parade Sign-Up: Come walk with us in the 4th of July Parade and help represent APA. We will be in the Oak Creek and Franklin parades. We will have all younger students under the age of 6 sit on our float/truck. For students ages 7 and up, we will teach a fun dance for them to do during the parade. Music students that do NOT want to dance, feel free to walk in the parades. We will have practice times for the students to come and learn the dance or can provide you with a video link to practice at home. Don’t worry; this will be an easy dance! Both locations will be doing the same dance so you can attend either location if the practice times work better. This will always be the same dance every year but to a different song. Practice dates will be available in the June newsletter. Heritage Days Parade: Join us for this fun parade on Saturday, July 28th in South Milwaukee! The South Milwaukee Heritage Days Parade starts at 11AM. Parade attire: Students under the age of 6, can wear their showcase costume (ballet shoes and tights are not necessary) or they can wear their academy t-shirt (given out at recitals) with shor ts and tennis shoes. 7 and older that will be dancing/walking, please wear your academy t-shirt with shorts/pants and tennis shoes. Use your best judgment to make sure the students are comfortable during the parade. Music Spring Recital – Our Music Recital will be held on Sunday, May 20th at the Oak Creek Salvation Army starting at 1pm. We usually have 5 acts starting at 1pm, 2pm, 3pm, 4pm & 5pm. In the past we have gone over our times so this will ensure we will run on time. It is located at 8853 S. Howell Ave. in Oak Creek. This is a beautiful space that seats up to 400 people. This is a free event for students and any friends or family. Please feel free to invite as many guests as you would like. The recital will be about 1 hour in length per act. Teachers will only be attending certain recitals they are assigned too. If you have not informed your teacher that you will be participating, please let them know ASAP! Performance orders will be emailed out by May 14th. Parent Observation Week May 7th-12th – We invite parents to come and sit in the classroom to see what your child has been working on in all dance, music, and acting classes. We will have enough chairs for each child to bring 2 people. If you choose to bring grandma or grandpa please bring additional chairs. If you have a younger child that can be disruptive to the class, please watch outside of the classroom through our observation windows. All students will receive a participation ribbon during this week. Our Oak Creek leveled ballet, tap and jazz classes will also receive a goal sheet. Optional Kringle Fundraiser – Our fundraiser has ended. If you still have a form that you forgot to turn in, we can still accept however we will deduct $10 off your profit. Profits will be in your account before May 15th! Where you drop off your order forms is the location you will pick up your order. Please remember there are refrigerated and frozen items that MUST be picked up on their set days b/c we do not have space to store these items. FR pick-up is Thursday, May 17th from 3p-6p. OC pick-up is Wednesday, May 16th from 3p-6p. Oak Creek Preschool REGISTRATION OPEN NOW!!! – CLICK HERE for our 2018-2019 summer & school year information. Summer Classes Monday, July 9th– Saturday, August 18th– Click here to view our summer programs! *Make sure to check out our NEW Mermaid Tumbling Camp! * Registration is OPEN!!! Remember we have over 800 students currently attending the studio. If you are interested in signing up for summer classes, please do so immediately to guarantee your spot. Full payment for the 6 week session is required to hold your spot and is nonrefundable. Fall Classes – Register NOW & Pay LATER Click here to register for Fall! Dance Classes: You can register online starting May 1st. In-person registration begins May 7th. Music Classes: You can CALL starting May 1st to register. Online enrollment for private music lessons will not be available until May 7th. When registering you will be charged your $25 yearly membership fee p/p ($40 max. per family) and on JUNE 15th you will be charged for September’s tuition. Preschool registration/supply fees are higher. Summer and Fall Dance Assistant Applications – If your child is going to be 10 years old by September 1st and is interested in assisting dance classes this summer and/or next school year, please click below to complete an assistant application. All summer applications are due no later than May 31st. For every 2 hours of class they assist for the summer session, they will receive a $61 credit for fall classes. All fall applications are due no later than July 25th. Fall classes: for every two 2 hours of class they assist per week, they receive a monthly $41 tuition credit. Please keep in mind the more flexibility and availability you have, the easier it is to schedule. Please make sure to review each application as there have been changes. Want to know more about what is expected when assisting, this article will answer many of your questions. 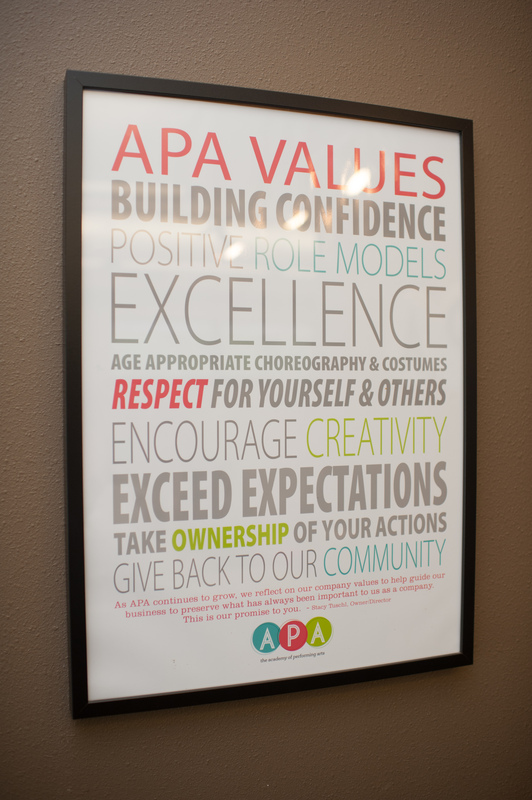 5 and 10 Year Awards – We want to celebrate you and your years at APA! If you have been an APA student for 5 or 10 years, please email Cara at [email protected] and we will make sure to recognize you and get you your trophy during showcase rehearsals. Daddy/Dancer Production @ our Spring Dance Showcase – Come join this FREE event. This is for current students performing in our spring dance showcase who want to dance with their father for an additional performance during their showcase time. Only one practice would be needed to learn the routine or if you can’t make it, we will have a video link for you to learn at home starting in June. Students will wear their costume on stage for the performance. Dads, please wear khaki pants or jeans and button up shirt for the performance. Both locations may attend either practice. Please register for your showcase time by CLICKING HERE. You may register for as many show times as you would like! Leveled Ballet and Teams – Low bun with middle part. If you are in a team/leveled ballet and a recreational class, please wear low bun with middle part hair for both! Video of Recital Dance – If you would like to record your child’s dance(s) for the Spring Showcase to practice at home please do this the week of Parent Observation Week IN CLASS, May 7th – May 12th. APA will not be recording the classes for Showcase. Music – If your student would like to practice at home with their music, please email us to receive your music link. Please remember it is very hard for us to get siblings to perform together. We run an enrollment report from families that register prior to June 15th and try to prioritize in the order that you register. If siblings perform in different shows, we will put a credit in your APA account for a value of 4 REGULAR tickets. Please notify us before May 14th so we can put the credit in your account before the final payment. Monday, May 14th: tickets can be purchased over the phone or in person. Cost: $14 for premium seats, $12 for regular seats and $10 obstructed view. Dance Showcase Volunteers – If you are interested in working backstage for our showcase, please let the desk know. You will not need to purchase a ticket and you will be able to see your son or daughter perform from the side of the stage or in the back of the auditorium. We need several volunteers for all 6 showcases.